This is Shannon from @RevApparel (via Twitter). 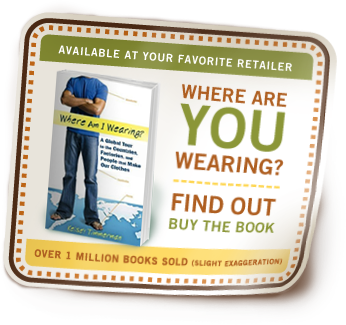 I started reading “Where Am I Wearing?” yesterday and have to tell you, I’ve flown through it. I’ve found it so interesting and very pertinent to what I’m currently pursuing. My business partner, Kristin and I are currently in Antigua, Guatemala, learning Spanish and putting the finishing touches on our business plan. We’re going down to Nicaragua in two weeks to start a fair trade apparel line with one of the cooperatives down there. All the cotton with be locally grown, the employees paid a fair and sustainable wage, as well as healthy working conditions. Anyhow, I get quite a few emails like this: An individual or a few individuals are starting X apparel company and they want to pick my brain about socially responsible sourcing. I always try to follow up and offer my two cents. They send me a few follow up questions and then the conversation ends and no one ever hears from the budding company again. I supposed most of them don’t make it. It can be tough starting up a business, let alone one that involves sourcing in a developing nation. Most don’t have a lot of money and it’s hard to win the attention of a factory to work with. That’s probably one of a thousand reasons that the company doesn’t work. On November 17, 2011 Revolution Apparel introduced their signature piece to the world. The Versalette can be worn 15 different ways (scarf, shirt, skirt, dress, head wrap, etc), and would be made in the United States of 100% recycled material (they never did find a factory to work with in Central America). They didn’t have the funds to go into production so they turned to Kickstarter. They launched a Kickstarter campaign to raise $20,000. If they reached their Kickstarter goal, they would be able to go into production. If they didn’t reach it, well, they’d probably find some other way. By December 22nd, they raised $64,246 from 796 backers! Today Shannon and Kristin and their company Revolution Apparel are about to ship their first order of Versalettes and will be launching a collection of 10 other versatile pieces later this year. We were determined to do it right – we wanted to create a business that preserved the environment, cut down on pesticide and chemical use, and said “no” to the exploitative labor that keeps our clothing cheap in the Western world. We wanted to create a business that was beneficial for every single person involved. At the time, we didn’t realize that attempting to do “good business” in the fashion industry is one of the tallest orders you can ask for. I don’t think the Versalette is versatile enough for me, a dude named Kelsey who lives in Indiana, to wear. Still, I love their mission, the way they’ve done things, and have enjoyed following their journey every step of the way. I can’t wait to see what they do next. I can’t wait to try on a Versalette. It seems like an ideal piece to bring to Central America. I am trying to learn how to pack light and I think the Versalette would be perfect for achieving that! Oh I’ve been wanting one of these! Perfect for my minimalistic and nomadic lifestyle. I clicked on the guest post link (“6 Clothing Companies Every Engaged Consumer Should Know About”), but evidently it’s been moved. I love that the Versalette is going to be made in the USA of 100% recycled materials. The Versalette is so beautiful! I would be honored to wear one should I win it! It looks so super light to wear and what a great way to lighten my luggage! As an aspiring minimalist I love the fashion and versatility of this piece. So exciting! I would love to win one and if I do, I promise to wear it for a month straight and blog about it (of course). i only buy what i need from consignment or charitable thrift stores and never shop without giving someone away! and if i win i promise to donate on your behalf! Sandi, I fixed the link. thanks for pointing that out. Rachel, I hope you’d wash it over the course of a month! Charlene, that’s a cool system! I’ve been following Revolution Apparel’s progress on their website/blog for quite awhile now. I am very excited to see the other pieces of the collection when they launch! Great story. It’s great to see young people bridging the gap between ideas and work- they’re truly being the change! I stumbled upon their site last year and have been following their work since. Inspiring! Also, a heads up- looks like you have a broken link to the guest-post they shared last year. I’m very impatiently waiting for the chance to buy one. This year, I’ve started slowly building up a small wardrobe of quality clothing that I can mix and match and will last me for years. Owning a Versalette will help save my closet space. If only all clothing companies cared about the environment as much as this one does. I think the Versalette is a fantastic idea! I have been counting down the days till the Versalette goes public, and patience is not my strong suite. Just ask Shannon, the co-founder of the company, as I have contacted her anxiously asking when I can get my hands on one for my up coming summer trip. You see, I went to college with Shannon and have been following the production of their stylish clothing line and would be proud to support their company’s mission. I now have the perfect excuse to try to get my hands on a Versalette – backpacking through Europe for the first time. I have been saving up money and vacation time to finally take my 4-week journey. I will be traveling through Ireland, France, and Spain with my well-traveled Australian friend who has explained the do’s and don’ts of backpacking. I know the many looks that Versalette offers could impress even someone as experienced as him. Being able to tour the beautiful countryside of Ireland to the more fashion forward cities of France in style, while not being bogged down with my bag would be ideal. I love that I would be able to manipulate this one piece of clothing to fit any situation I may find myself in, whether it’s sipping a glass of a French Bordeaux overlooking a vineyard or dancing an Irish jig at a local pub, makes it the perfect must-have for this journey. Memories of this trip will last me a lifetime, so I want the perfect piece of clothing that’s both timeless and functional to keep me comfortable and looking good. This one garment speaks to the philosophy of this trip for me – less is more. Amazing story, really want to try one on! I’ve been following this company for about 6 months now, ever since I found them via a travel blog i read (www.answeringoliver.com) i LOVE the versalette! would love to win one. So excited about this product! hope to use mine during my summer adventures! I love the versalette! Would love to win one! I love this idea, love the company, the way it started and the female founders behind it all! The versalette inspires me to plan long, exciting trips! Every since I found out about the versalette I have been excited to purchase one! I am check out their blogs as much as possible to see how the production is going! Seriously wanted to help out with the kick-start last year, but was going through a nasty divorce. So I was hoping to pre-order. Now, I am just waiting as patiently as possible…. which isn’t working to well. I love all the different looks, and I am trying to become more versatile myself on my clothing. All thanks to them. I missed the opportunity to pre-order a Versalette and I’ve been checking their website at least once a day (even though I subscribe to the newsletter and knew that it would be at least mid-April before the new website was launched) so that I could order one when they were available again. I can hardly wait to get one!! It looks awesome; best wishes to the creators on a very successful launch! I’ve been following the progress of the Versalette, and am planning on buying one for sure. I travel with a band 200 days a year, so lightening my suitcase is always a good thing! Absolutely love everything about the Versalette. There isn’t much more to say. It’s an absolutely brilliant project and I hope many more people see it and are inspired. This is easily the coolest piece of clothing I’ve ever seen! What an amazing business, I can’t wait to see the rest of the collection, too. Viva Versalette! What a great item… would love to get my hands on one of them. Crossing my fingers and wishing them all the success there is! I have been so excited for this to come out – I have been watching their progress for quite a while now! Would be so awesome to win one! I am so glad to have discovered your blog via the Versalette fb page! Great stuff! I would love to win another versalette… I can’t wait to get the one I’ve ordered! These girls are just awesome. What they are doing and how they’ve gone about it all, they amaze me every time I turn around. Love what I’ve seen/read about the versalette. Hoping to see the real deal! Love, LOVE the Versalette! I’ve been following their journey in Facebook and the blog and am very excited as the time seems yo be drawing closer when we’ll actually be able to order one! Can’t wait to see what other awesome pieces these girls come up with in their line. The Versallette is wicked cool. I can’t wait for the rest of the collection to be available. I love the versalette, especially since it supports local textile companies and uses recycled water bottles. It would be the perfect travel companion. I love the idea of the Versalette and can’t wait to see the full line released. It’s inspiring me to think more about what I wear and how I buy things! These are the sorts of heart-warming stories that give you hope that we can make change for the better! What an inspiring story. And, a really clever and cute product, too! Sounds like an awesome product! So great hearing about all of these wonderful companies. 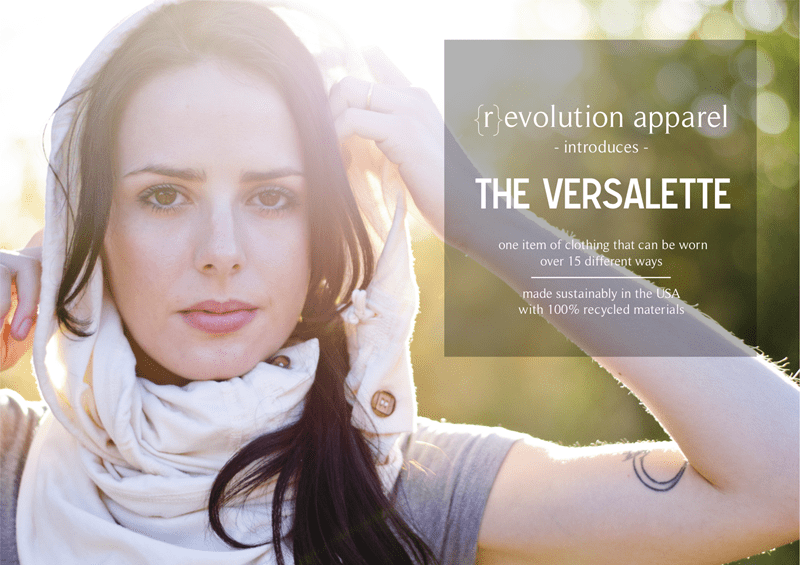 I like the whole concept behind revolution apparel and would love to win a versalette. The world needs more of people who presue their dreams like these ladies and help the environment as well. I just love the concept, this a beautiful, unique, wonderful piece of clothe, I want one!!! Love the Versalette! I can’t wait for more of Kristen’s & Shannon’s fashions to be put into production, HOORAY for sustainability! Have been fascinated by the Versalette for months. Would love to have one…thanks! Oooh! Can’t wait for the Versalette! Love responsible clothing companies! I can’t wait until these are back for sale, since I missed the pre-order! They make so much sense…great for sustainability and minimalism! I would LOVE one of these–anything to make the backpack lighter! A variety of looks for a quarter of the pack space? Love it.! This looks exciting. Cute, versatile and a business that preserves the environment! So cool! I would love to have a Versalette. I had the privilege of meeting the two ladies who created the company, and I love their vision of sustainable clothing! I wish them the best! From the moment I heard about the Versalette I’ve been hovering the site – and I would have already ordered one, but I can’t decide on what color to get. Stay with a neutral? Green? Blue?! I hope to someday own more than one; can’t wait to have another way to practice the preaching of a more minimal lifestyle in a country that’s all about more. Love it. Random.org selected #2 which was assigned to Sarah Royer! Sarah, I’ll email you with the details soon in order to get you the highly prized Versalette. Thanks everybody for all of the great comments and thanks to Revolution Apparel for being awesome and inspiring. I can’t wait to wear it in grad school, when I will be lucky if I got myself dressed in the morning. Not much laundry to do and it’s great for someone too busy to care about fashion. Very cool! And a great success story. I hope I win. Great idea, great product. Can’t wait to get some of these!! Love the idea – cannot wait to invest!